The deadline for filing taxes is fast approaching. Many people have difficulty getting their financial records in order (if they can even find them!). This can be especially painful for those with ADHD or executive function challenges. Be realistic. 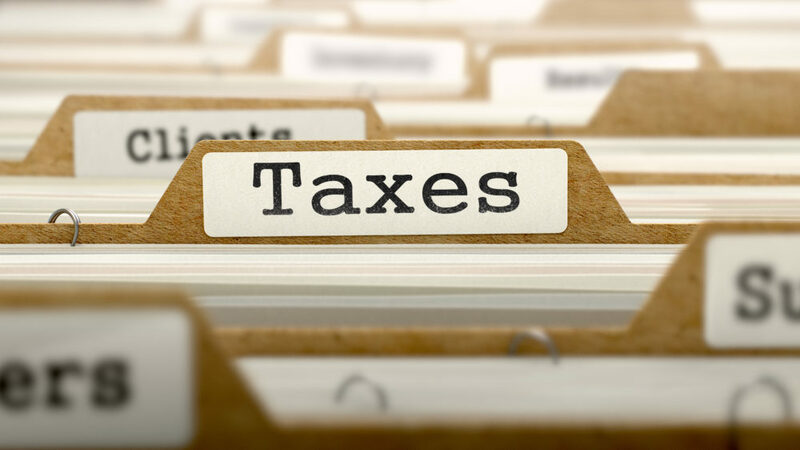 What is the likelihood that you will have your personal taxes ready to post or postmark by April 15th? (April 17th in 2017.) If it is slim, or predicated on wishful thinking, file for an extension now, to avoid penalties for late filing (you’ll still have to pay taxes and interest, so the sooner you file, the better). Avoid avoidance. It is possible to overcome major avoidance, which is what keeps many people from getting their taxes done on time. For some of us, just the idea of finding and gathering all of the information feels overwhelming. And when something is overwhelming, we’ll do anything to avoid dealing with it (including putting it off despite the financial consequences). So accept that tax prep is a necessary evil, and make it easier by treating it as a PROJECT – not a task. A project consists of many tasks, and you can only do one at a time! Begin by breaking down this project into various steps (the individual tasks). Some of these are itemized below. The idea is to focus on a single task at a time, so you aren’t overloaded by everything that needs doing. Don’t say ‘YES’ unless you can say ‘WHEN.’ After you’ve decided what tasks you’ll need to do in order to finish your Tax Prep Project, decide when you’ll do them. Enter each task on your calendar, as a Task-Appointment, which is an appointment with yourself to do a specific thing at a specific time. This dramatically increases the likelihood that you’ll actually work on the task. It is easier to wrap your head and energy around beginning a specific task (activate!) then it is to think about accomplishing the entire project. And if a task looks like it will take too long to complete in one appointment (given your attention span and other obligations), just work on it for a set amount of time. If you do that, you’ll have met your goal (even if the task itself isn’t finished). By doing what you planned, you’ll feel successful, and so more likely continue with other Task-Appointments and complete the project. Success breeds success. Task #1 Gather Papers. Begin by gathering the many financial papers you probably have in several different places, and put them in one location, even if you use the proverbial shoebox to hold everything! Don’t review them; don’t think about them. Just collect. Task #2 Sort into Categories. Sort the various papers you’ve gathered into categories (receipts, statements, tax reporting forms). Put them in separate folders (paper or poly project files) or just stack the papers, writing the category name on a blank paper kept on top of the pile. If you do your banking/investing/accounting by computer, set up a folder for the tax year, and include all relevant downloads. Task #3 Group your Deductions. If you itemize, group your family’s deductible receipts (medical, charitable contributions, childcare, education, business expenses, etc.). Note: You can request an annual statement from your local or mail order pharmacy that itemizes all medication expenses, so you don’t need to worry about keeping each receipt during the year. Obtaining this statement can be a separate Task (visit the pharmacy… make the call… or download the pharmacy record). Task #4 Review Banking Documents. Go through your checkbooks, bank and credit card statements for possible deductible expenses. Note: If you are reimbursed for a medical expense, it is not a deduction. Task #5 Determine if Anything is Missing. Are any reporting forms missing? (W2 or 1099’s, property or school taxes, mortgage interest, bank interest, investment records, stock dividends, etc.) You should have a list of what to look for from your accountant or tax preparer (many will send you a tax preparation document that you can just fill in with your information). If not, several are available online or through the IRS or free (legitimate) tax prep websites. If any critical reporting forms are missing, set a Task to contact the originator for a copy. Do this early enough to get the information before the filing deadline! Note: Accountants may have different requirements as to what documentation they need to do your taxes, so check in advance. Task #6 Tally the Results. Go through each category, list the details (whether using paper or computer) and add up the totals. Task #7 Make your IRA Contributions before April 15th, if you intend to deduct them for the prior year. Task #8 Complete the actual Tax Return Forms. Having everything organized isn’t enough – now it’s time to complete the actual tax returns, and submit them before the tax deadline. You can complete the forms yourself, use legitimate online tax software, or give your prep work to your accountant or tax preparer. 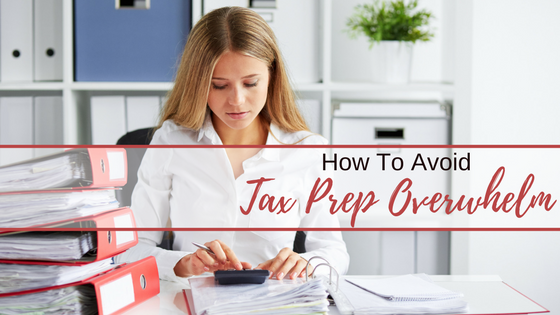 Take your Tax Prep Project a baby step, or task, at a time, and it will be easier to complete it without getting into a state of overwhelm or frustration. Hopefully you can do this in time to file by the due date, but if not, by or before the extension deadline. Don’t ignore them – taxes DON’T just go away! Worse, the amount you’ll owe will increase if you don’t file on time. As a coach and organizer who mostly works with clients who have ADHD or executive function challenges, I’ve seen SO many who didn’t file taxes, even though they had the money to pay them or didn’t even owe money. Some were in dire trouble with the IRS. All because of overwhelm and avoidance! Prepare now for a stress free next year. If you want next year to be less stressful, set up a system now, instead of scrambling next March. Use the category folders (Task #2) to file the appropriate papers as you receive them, so you’ll only have one place to look when it’s tax prep time. Consider keeping everything in a convenient magazine holder or file tray on or near your desk (the less effort you have to put into filing, the more likely you’ll be to do it). Some people prefer to scan each paper as it comes it in, so they don’t have to worry about storing/sorting papers. If organizing for tax preparation is a challenge, work with someone to set up a simple system for managing your financial papers. It is worth the investment to hire a professional, given the possible penalties and interest due to late filings, the potential savings from having a clear record of all deductible items and from spending less time (and money) with your accountant and, perhaps most important, the reduced stress and improved comfort level you’ll experience. Find a local organizer who specializes in these systems at the National Association of Professional Organizers, www.napo.net or the American Association of Daily Money Managers, http://www.aadmm.com/findDMM.php.